Help Jack Give Back on March 27th! Jack Mitchell has developed a reputation of willingness to do things most of us would consider crazy in order to raise money for organizations that do good in Lincoln and the surrounding areas, but his latest effort is going to take he and the United Way of Lincoln and Lancaster County to new heights. The United Way is helping those impacted by devastating floods with a disaster relief fund to support flood relief efforts of United Way of Lincoln and Lancaster County Agencies. So how does Jack fit in? He’s agreed to spend a full day marooned on the Lincoln Scheels’ ferris wheel in exchange for your donations. If you simply want to support his marathon day of going round and round, donate here. Or, if you want to provide even more support to Jack, with your donation of $25 or more, you can keep Jack company for 15 minutes during his day-long ride. Jack will also be opening up his rolodex to invite friends of the show and area public figures to join him on the wheel, or at very least, to wave from the ground for moral support. 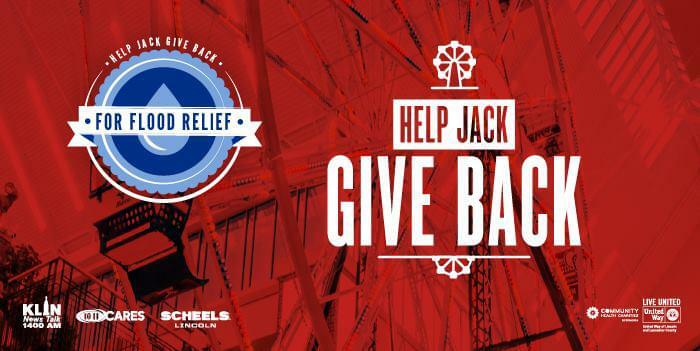 We’d love to see you out at Scheels’ to be a part of the fun and giving on Wednesday, March 27 from 9:30 a.m. -7 p.m. Stop by and Help Jack Give Back!